An E-Book starts just like a traditional book. All you really need is a word processing program (like Microsoft Word or Apple iWorks Pages,) and a program that will turn that Word or Pages file into a PDF. PDF stands for Portable Document Format (read more about it at Wikipedia). It’s the de-facto way to deliver written materials via email or the web. When you turn your Word or Pages document into a PDF, it means that no one can edit it and when your readers open it, it will look exactly like you created it. Every computer for the last 10 years or so comes with a PDF reader on it, so anyone can open it. 1. E-Books are “almost” free to distribute. I say “almost” because it does require an online presence, a website or a blog. There has to a place where the E-Book is available. 2. E-Books are “almost” free to create! All you need is an idea, a computer, Word or Pages and a PDF creator. If you have a Macintosh computer, creating a PDF is as easy as printing. When you go to print, you have the option to print it as a PDF, which means it SAVES it as a PDF on your computer. If you don’t have a Macintosh, you have to have some kind of PDF writer installed on your PC. If you Google PDF writer, you’ll find a lot of options. 3. 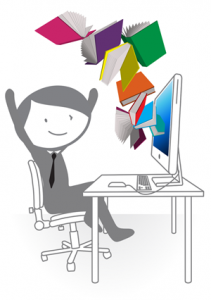 E-Books are a GREAT way to give your readers valuable information and grow your email list! When you give an e-book to your readers for free, you can ask them for an email address. I get hundreds of new people on my list every year by promoting a few times on Facebook, Twitter, Linkedin and Pinterest. Once the e-book is written and uploaded to your website, you can leverage it over and over again, gaining new followers and clients. 4. You can SELL E-Books. Think of the profit, once you have your website and/or blog set up (of course you need to incorporate PayPal or some kind of payment gateway.) E-books go from 10 bucks to hundreds. E-books that are bundled with audio and video files can sell for hundreds and thousands of dollars. 5. E-Books give you credibility. If you’ve taken the time to write about a topic in your industry and create an e-book, people know you’re serious and care enough to do the work. Even if you give them away for free! You are creating contacts who trust you – which is the first step to buying from you! Now – sign up for one of my FREE e-books in the right hand column! It’s great content and you’ll understand what I’m talking about by going through the sign up process. Do you have a good E-Book story? I’d love to hear it! When it comes to marketing, exposure is a good thing. The more we are seen around the internet the easier it is for us to be seen as an authority. By sharing our knowledge we can help others while building our reputation as the ‘go-to person’ in our particular niche. Thanks Duke! It’s so true that the more you help others with your knowledge and expertise, the more your company will grow. And what most people don’t realize is it’s pretty easy!